Hours spent together in rehearsal, dorms, dining hall, and in recreations provide experiences for the students to "bond"
The entire experience strengthens the students' level of maturity and responsibility and generally sets the standard of behavior for the rest of the year. We are very fortunate to be able to spend this week together as it represents much sacrifice and trust from the parents and administration. Bring completed hardcopy of the WCPSS Parental Consent & Medical Form to the first day of Pre-Camp. 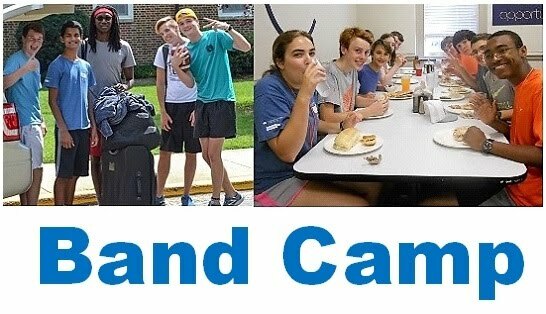 Bring copy of the student's Health Insurance Card (both sides) to the first day of Pre-Camp. Bring completed hardcopy of the WCPSS Photo Permission Form to the first day of Pre-Camp. All participants should have completed the online "Marching Band Student Information & Intent Form" prior to first Friday in June. Form is located on Forms page of this website under the Marching Band Forms header.